R&R Components floor trusses are designed by our skilled engineering and design staff. With many years of experience, our staff has encountered and designed nearly every shape imaginable. You can be assured that our staff is educated and skilled as well as any in the building component industry. 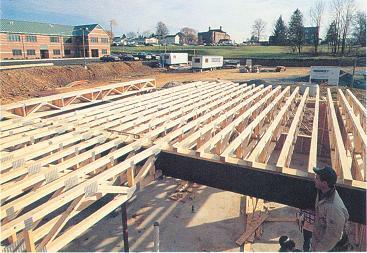 Floor trusses are a unique product that is mostly used in townhouses, condominiums, and various other multi-family projects. 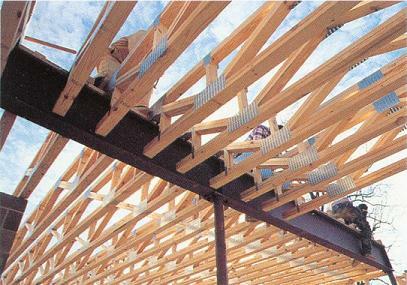 Often called open web floor joist because of their inherent design, floor trusses are ideal for unusually long spans and hiding mechanical/electrical trades within the ceiling space. Regardless of your project size, allow R&R Components to provide you with all your floor truss needs. All quotes are free of charge. Longer clear spans and in many cases, the elimination of support beams. More floor uniformity and increased sub-flooring nailing area. A reduction in subcontractor costs. Floor trusses are lightweight and easy to handle, so installation is easier and faster. Unsightly wires, furnace ducts and pipes are placed out of view. High strength and rigidity resulting in low deflection characteristics. Ideal for long spans eliminating costly beams.